I have just taught my 9-year old GDD to sew and she is raring to start a project. What would you suggest, a quick small quilt, or possibly a pattern for a simple dress (doll?) or.....? I used to love to make clothes for my Barbies but they were so hard cause those Barbies are small. Someone on chat last night mentioned they made dog beds with their granddaughter. That would be wonderful. If no one has a pet, she could make a bed or a small blanket and take to a shelter. Most girls that age love volunteering. Made throw pillow with mine, she loved making it an was able to use it on her bed. What does she want to be for Halloween? Is there some way you could help her make all or part of her costume? Many types of Halloween costumes do not have to be fitted all that well and don't have to have perfect hems. I think they can make great beginner projects. Witches or angels can both use skirts that are just gathered on an elastic band. Any type of cape is pretty easy. If Halloween is a possibility for you, you will find 1000's of ideas online. I started my girls out with simple 9-patches which they then turned into pot holders for adults on their christmas lists. A nice set of potholders for Mom for Christmas might be nice. A simple 9 patch block on the front, plain backs and a couple of layers of insulbrute for batt if you have it. Do then pillowcase style so she doesn't have to do binding. I just did a sewing camp at our church this summer and we taught the girls how to make a big easy tote bag. 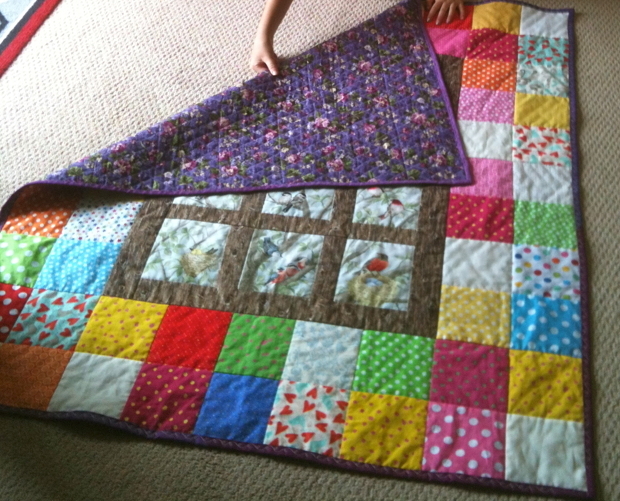 My Grands first quilts were big 4 patches. They're easy to do and give the kids an early success. My grands start with a pillowcase for their bed. Then they move up to aprons. I do the cutting and pressing. When they are 9 they get to go to sewing camp for a week. My 11 year old granddaughter is taking off with sewing - she made herself a "Classmate" bag for school. Then she made a "Professional Tote". We will be entering them both in the fair. Nine patch quilts are good for them also. Clothes for the American Girl doll are easy to sew and they aren't too small to work with. (get an 18" doll at Walmart if she doesn't have an AmericanGirl). Good luck and have fun sewing. You have opened up a whole new world for her! The brick type quilts are easy to make. Just decide on a rectangle size & let her sew them in strips lengthwise. Then, decide on the width of the quilt & start with a half brick on the first row. Start the second row with a full brick, then keep alternating. If you have a focus fabric she loves, let her put a large section (equal to two or three rows) in as a random fabric. There are no seams to match & she can make any size she wants. Pillow cases or pajama pants are a good beginner project. A throw size quilt.....maybe a Yellow Brick Road pattern would be good too. Some things you might consider....apron, pillowcase, personal sized raggyquilt, tote bag. Have fun! So that she stays excited about it... maybe get a few good ideas for simple starter projects and then ask her what sort of thing she wants to make first. Pillows, small/simple quilt for her dolls, a simple doll dress, or something for her mom/dad like pot holders or an apron. Or even an apron for herself if she would like that sort of thing, or a jacket for the dog if she has one. Just something that will hold her interest and attention and not take a long time to complete. Beanbags are great. They get to make them, then have fun throwing them at a target. My 9 year old granddaughter started with skirts with elastic waist bands when she was 5. Now she is making quilts and pot holders. The easy table runner is a good project, also. What I would suggest. too. My nine year old niece made a twin size quilt using a layer cake. It taught her to have to match up seams for each row and to add a border. She is so proud of it but it was easy enough that she made progress quickly. We did the binding for her. Here is what my 9 year old granddaughter created with me during her 2 week stay in July. We completed this one in a week. I had the bird fabric and suggested we start from there. She learned to sew on the sewing machine, cut out the blocks, laid out the colors(that one took a while), lined up the backing with the batting, hand stitched part of the binding and sewed on her own label. Went back home and told her mom she wanted a sewing machine and they started looking for one. Last edited by QuiltingHaven; 08-15-2013 at 03:55 AM. My little girl grands have recently learned to sew in 4-H. I saw a video on MSQC using a wacky web template and piecing papers. So I saw a chance to use my scraps and it is pretty forgiving. I cut the center part out and attach to paper with a dot of glue. Then they have at it using the scraps. Learning to press, sew, and press. The 10-year old said "this is fun." She also confided that she had had to rip the seam out of a pair of shorts TWICE so she was thinking that this was pretty easy and cool. She is now amped to make a quilt for her bed and had to show her dad the start of her quilt up on the design board. Now the others are getting excited to start theirs. I would recommend that you ask her if she wants to do clothing or quilting, as the skills for each are similar but different. If she wants to make a quilt, start with a simple 4-patch or 9-patch, and she will learn sewing a good 1/4" seam, matching seams, chain piecing and pressing. You can do scrappy or planned blocks, and she wil learn about coordinating / contrasting colors. Then she'll learn about sashing, borders, batting, layering, quilting and binding. I started my granddaughters out with a stack and whack. I cut it for them and then gave them the pieces to sew. If their seams were a little off it didn't matter as we had to square up the blocks. Since none of the seams had to match they felt a real sense of accomplishment at their beautiful squares. They all picked out their fabric from Grammy's stash and that was just part of the fun we had. We even left the three year old give it a try while I guided the fabric she pressed the pedal. What a blast we had. Clothes (of any size) are tough. Start with straight line sewing. A small quilt would work, as would the pillow tops and potholders others mentioned. If you pick something too hard, it might get discouraging. Enjoy working together!! With one of our DGD, I helped her to make throw pillows. We took a nice sturdy solid fabric and she learned to do decorative stitching by following the grid she had done on her pillow top. She had brought a little friend along so they each made their own pillow. Another DGD went to a sewing school with my daughter (her aunt). They did a simple pajama pants and a camisole. They also did a rag quilt and a simple paper pieced wall hanging (the jar block). You could also let her make a doll quilt or wall hanging for her bedroom. You have been given lots of good ideas. Keep it simple so she can succeed. Soon you'll have a quilting companion!